Flaky homemade pie crust with cream cheese filling and topped with glazed peaches. 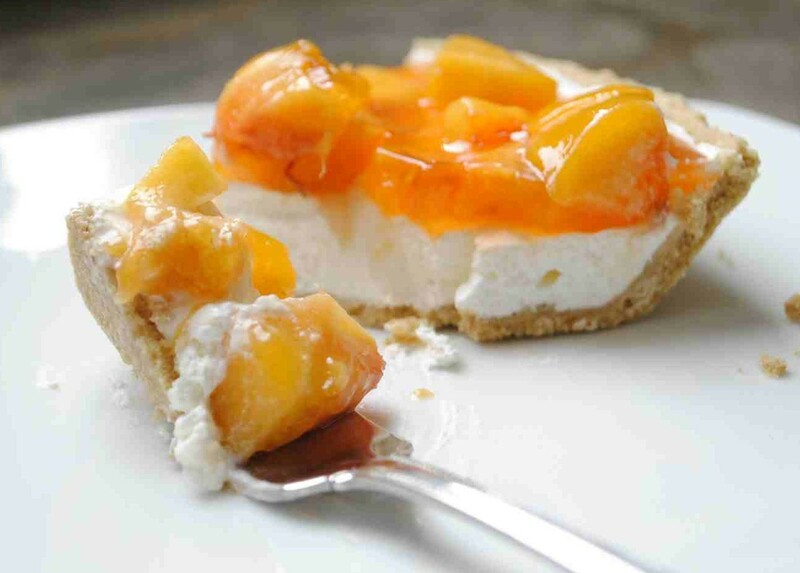 Here is an easy dessert recipe for Peaches & Cream Cheese Pie. Place cream cheese in a bowl and beat using an electric mixer set on medium speed until smooth. Gradually add eggs, sugar, milk, and vanilla, beating well after each addition. Pour mixture into the pie crust and bake for 30 minutes, or until the center is set. Remove from oven and cool on a wire rack. Meanwhile, drain sliced peaches in syrup; reserve 1 cup of the syrup; set aside. Combine cornstarch, sugar and reserved peach syrup and lemon juice in a small saucepan. Stir to combine. Cook over medium heat, stirring constantly, until the mixture boils and thickens. Remove from the heat, allow to cool for 5 to 10 minutes. Stir in almond extract. Set aside. Arrange the peach slices in a circle, petal fashion, on top of the filling. Garnish with sliced maraschino cherries. Spoon the glaze over the fruit. Cover and refrigerate for at least 1 hour, or until set. Makes 8 servings.